Students in Michael Ryan’s guitar ensemble hit the high note of the semester during their recital last Friday in Morgan Auditorium. The six performers included University of La Verne music instructor Michael Ryan as well as five students – sophomore television broadcast major Nathan Keeler, senior liberal studies major Emma Petrelli, junior criminology major Myreilly Ramirez, freshman criminology major Lyndzi Stockton and freshman music major Adrian Zuñiga. All five students are members of Ryan’s Guitar Ensemble class, which is offered every semester. It is open to anyone who can play guitar. “Practicing for this class has been my stress reliever for this semester,” said Petrelli. This is Petrelli’s fourth time taking the Guitar Ensemble class. She said that although the class can be time consuming, it is also very fun and rewarding for her. 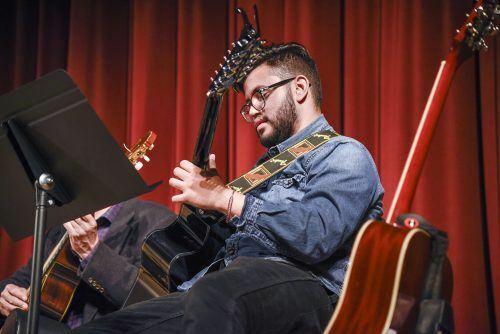 “‘La Llorona’ was my favorite song to perform because it was the hardest to learn, but I think that we performed it pretty well,” Petrelli said. “La Llorona,” a piece that was reminiscent of a lullaby, was among the 10 songs performed at the recital. The other songs included some slower, more somber or peaceful songs like the traditional “Sakura,” “Mourqui” by Leopold Mozart, “Hallelujah” by Leonard Cohen and “Blackbird” by the Beatles. Others, such as “He’s a Pirate” by Klaus Badelt, as well as some traditional pieces like “El Manicero” and “Drunken Sailor,” were more fast-paced and intense at times. “When you hear them, they really work well with guitar,” Ryan said of the eclectic group of musical pieces. Zuñiga enjoyed learning the songs and getting to play them on two different guitars. “The Mozart piece was really difficult, and so was ‘La Llorona,’” Zuñiga said. He played a six-string guitar for much of the performance, but he switched to a 12-string guitar when he played “El Manicero,” a playful, fast-paced song that he performed as a duet alongside Ryan. “El Manicero” is a traditional song that is usually played on a 12-string guitar because a 12-string produces a richer tone. “It made me want to pick up a guitar and learn,” Alyssa Muñoz, sophomore broadcast television major, said. Of the 30 or so attendees in the audience, the crowd’s favorite seemed to be “Hallelujah” by Leonard Cohen, which was familiar because of the University of La Verne Chamber Singers’ recent rendition of it at their concert. “I definitely had goosebumps when they played ‘Hallelujah,’” Jesslyn Ponce, junior kinesiology major, said. “It was music to my ears,” Muñoz said. The music department’s upcoming events include the ULV Chamber Ensemble’s concert at 7 p.m. Friday in the Jane Dibbell Cabaret Theatre and Brooke Soto’s senior vocal recital at 7 p.m. Saturday in Morgan Auditorium. Remy Hogan can be reached at remy.hogan@laverne.edu.